MORGANTON, North Carolina — Speaker John Boehner’s worst nightmare is on the rise here in rural North Carolina. Rep. Mark Meadows (R-NC) is gaining steam as a clearly coordinated, highly orchestrated effort to remove Boehner as Speaker of the United States House of Representatives—and fix a broken Congress that no longer represents the wishes of the American people—comes into much clearer focus. Meadows invited Breitbart News to accompany him on a district visit, and the concerns he discussed with his constituents offer a microcosm of the issues America wants Congress to address. Everyone here agrees: John Boehner needs to go as Speaker of the House, and Mark Meadows is doing something about that. Unlike some others from the more conservative side of the House GOP conference, Meadows is calm, cool and collected. 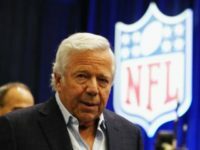 He doesn’t make headline-grabbing comments, and is a serious, well-connected and well-respected member of the conference. Despite clear efforts by leadership—Boehner’s office and its allies, including Chief Deputy Whip Rep. Patrick McHenry (R-NC) who represents the district bordering Meadows’ here—to isolate him, Meadows’ credibility in the House GOP conference only seems to grow by the minute thanks to his steady demeanor and well-intentioned aim to steer Congress back onto a track that more effectively represents America’s views in Washington. Meadows, one of 24 members who at the beginning of this Congress voted for a Republican alternative to Boehner alongside one—Rep. Brian Babin (R-TX) who voted “present,” which was technically a meaningless vote—believes it’s safe to assume that that 25 members will vote once again to remove Boehner as Speaker of the House should he bring his motion to vacate the chair up as a privileged resolution in the fall. At least three more—Reps. Raul Labrador (R-ID), Mick Mulvaney (R-SC), and Matt Salmon (R-AZ)—have publicly pledged they will join him. Several more, including major power player conservatives, have behind the scenes promised they will not support Boehner’s re-election as Speaker. Meadows is not putting himself forward as a candidate to challenge Boehner for the speakership, but he is spearheading the process to replace Boehner—serving as its public face. The process goes something like this: Meadows will, or anyone else might, offer as a privileged resolution a motion to vacate the chair of the House. That means there would be an automatic vote where Boehner would need to rally support to either get re-elected or lose re-election. If every member of the House is present and votes, then the benchmark for Boehner to lose re-election is that 29 Republicans must vote to get rid of him—assuming no Democrats vote for Boehner. With 28 now publicly opposed to his re-election, as many more are privately opposed to his re-election, it looks more and more likely that if such a vote came up—Meadows or any other member could force it within two days of offering the motion as a privileged resolution—Boehner would not be re-elected without help from the Democratic Party. If Boehner loses re-election, then the House will go into a briefly chaotic process of finding a new Speaker before more official business can be conducted. That person could be any citizen of the United States, but more likely than not will be a different member of the House than Boehner. Meadows’ mission is not political. He’s not seeking more power for himself. He’s also not seeking to advance any special cause or interest, or seeking revenge against Boehner for some wrong the Speaker did him or some slight perceived. He’s trying to fix Congress, which is obviously in the minds of Americans broken right now, and he’s going for the jugular of the permanent political class with a reform mindset that isn’t a personal squabble with Boehner but an effort to restore Congress as the voice of the people in government. “I think everybody starts out doing that because they’re real sensitive to the fact that they just got into office and say, ‘Golly, I want to be a voice for the people,’” Meadows said when asked if enough members of Congress come back to their districts enough to actually listen to their constituents. The longer they’re there, the less likely you are to listen. For me, I’ve had to redouble my effort and not say, okay, pay attention to what are the priorities in Washington, D.C., but really try to listen to what are the priorities here? There are some of them that have been difficult for me. A prime example is on the Syrian invasion, where really they were bantering back and forth on should we invade Syria or not? I had my own personal view, the fact I believed that ISIS was going to continue to grow and that we had to go in and put an end to it right away really quickly. I was war weary, but I felt like we needed to do that. My district started calling the office and sending in surveys and other things as well—87 percent of the people that contacted us, or it could have been 82, 82 or 87 percent of the people said ‘we don’t want you to do that.’ We’re tired of wars. It shifted where we were to saying “just listen, the people back home…” and it wasn’t just Republicans it was Democrats, independents, everyone. For us, it’s just about trying to have an open ear then going to Washington, D.C., and voting the way the people here want you to vote. When you do that it sometimes puts you at odds with what is deemed pragmatic in Washington, D.C., or “the practical thing to do,” but I try to conduct at least a couple days of really listening every time I come back especially if it’s for a week or longer where I’m just listening to people. Both the good and the bad. We’re going to continue to try to get better. Down here, he didn’t just tell Breitbart News about this in an interview. He showed us throughout a full listening tour day, where he went around to meet with scores of constituents. Meadows held several official congressional business meetings and activities throughout the day in his district here on Thursday, a full day of constituent work and discussions with key stakeholders on various issues on which Breitbart News accompanied him. 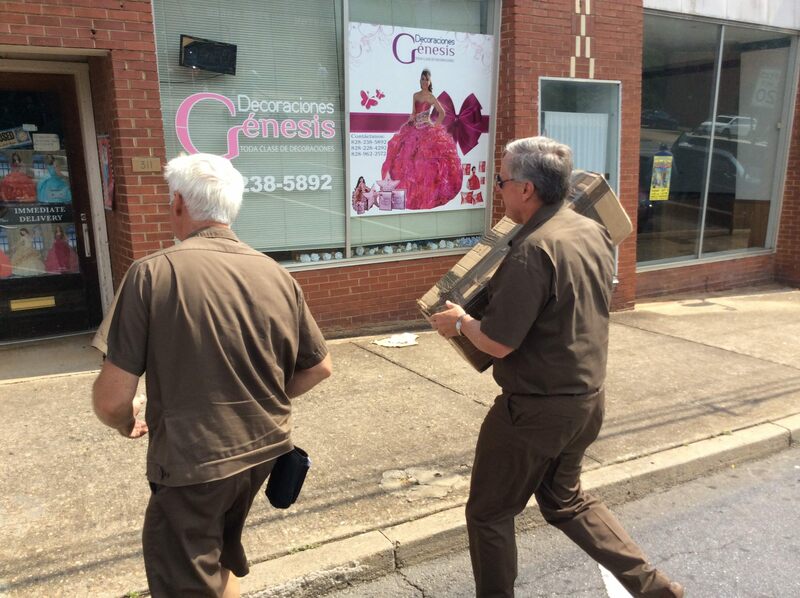 Early in the day, downtown here in Morganton, he dressed up in a brown UPS uniform to join delivery driver Marvin Aldridge around downtown to several stops on his route. 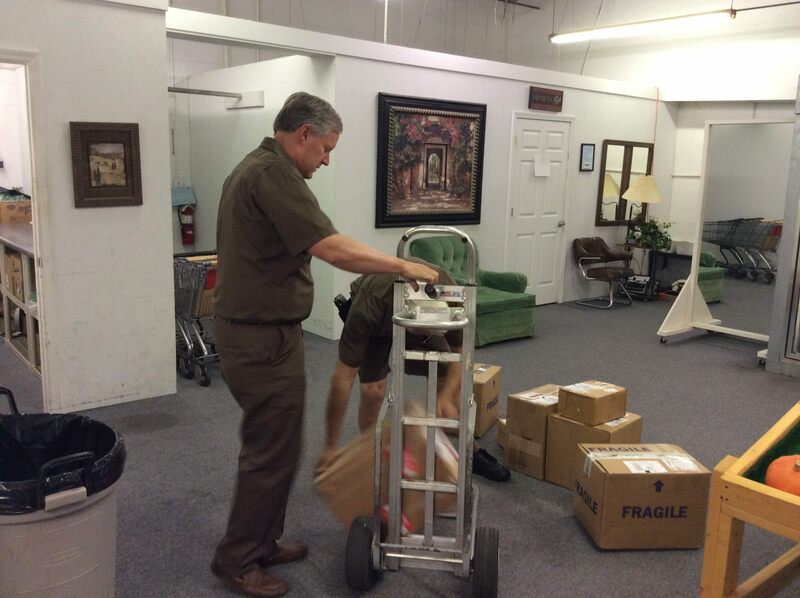 As Meadows and Aldridge delivered packages to various small businesses—which apparently weren’t alerted to the fact a U.S. 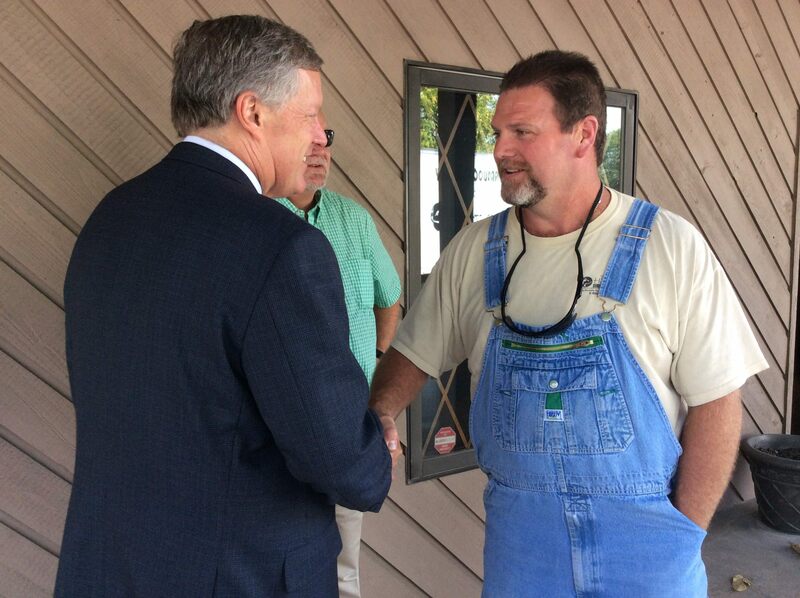 Congressman would be dropping off their orders that week—Meadows introduced himself to the workers and owners in each. 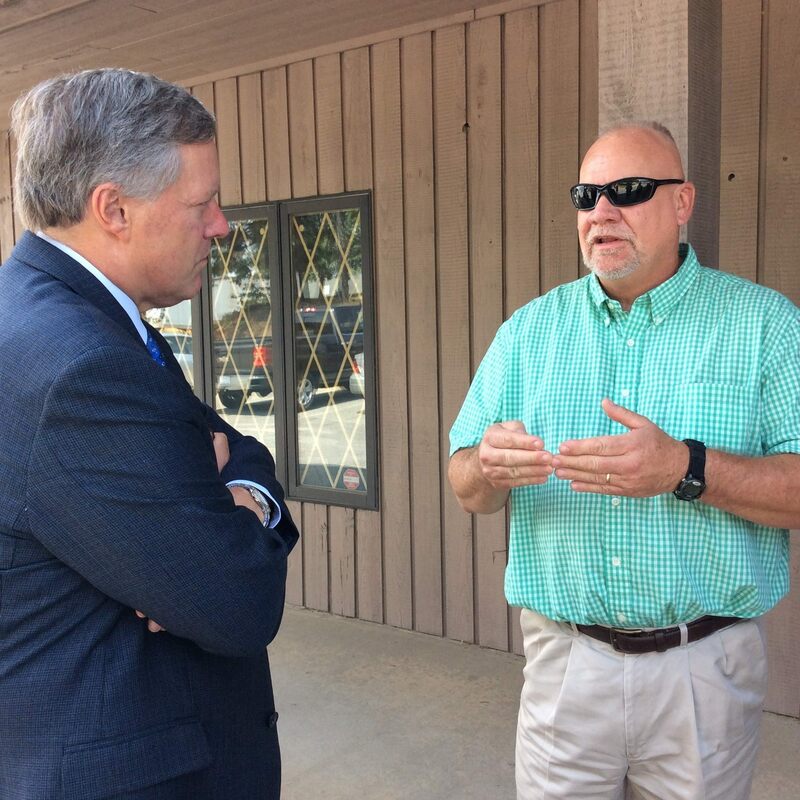 “Where’d you order it,” Meadows asked the proprietor of Cole’s Auto in downtown Morganton, the first stop on his trip with Aldridge. “When did you order it?” Aldridge asked. “That’s pretty good,” Meadows commented. From there, it was on to the next stop, Morganton Children’s Dental Center. When Meadows and Aldridge delivered the package to the secretary at the desk inside—and Meadows introduced himself again—the woman was stunned. “You just might make the newspaper,” Meadows joked with her. “No way, yeah right,” she replied. “Well, if you ever want to put on tire changing clothes, come on down here,” one replied. 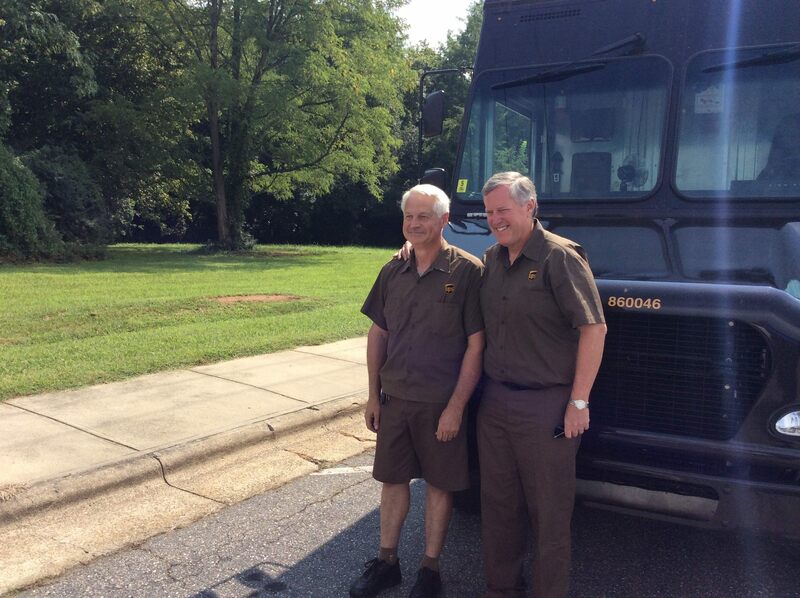 “Oh golly, I may take you up on that—don’t tell my wife, but I may take you up on that,” Meadows joked as everyone laughed before hopping back in the brown UPS van onto the next stop, deliveries for a wedding dress company that were left next door since that business’ owners weren’t in the office on Thursday morning. Across the street at Morganton Natural Foods, Aldridge and Meadows made the biggest delivery of the day loading up a full UPS pull cart with packages before wheeling it into the back room of the food store. 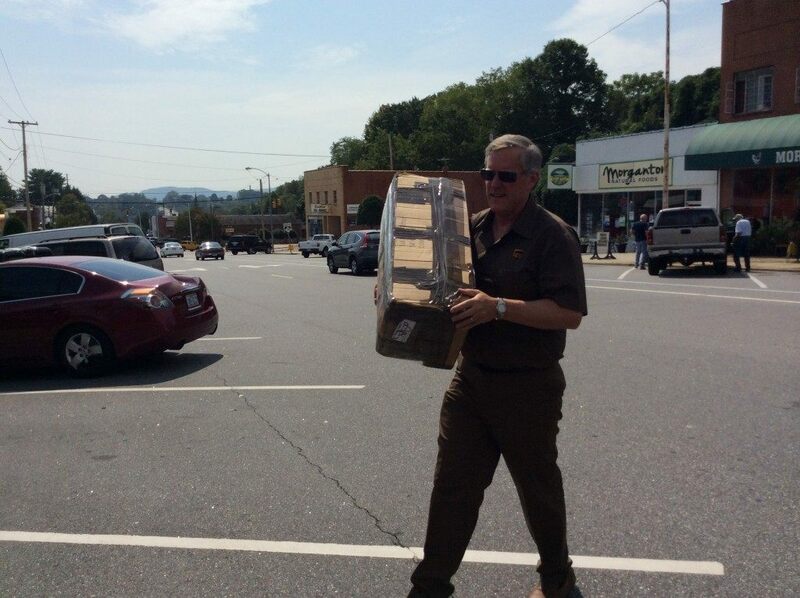 After a brief back-and-forth with the owner, they were off to the next stop—Jay’s Pharmacy—which they made it to after almost accidentally stopping at Morganton Drug store. 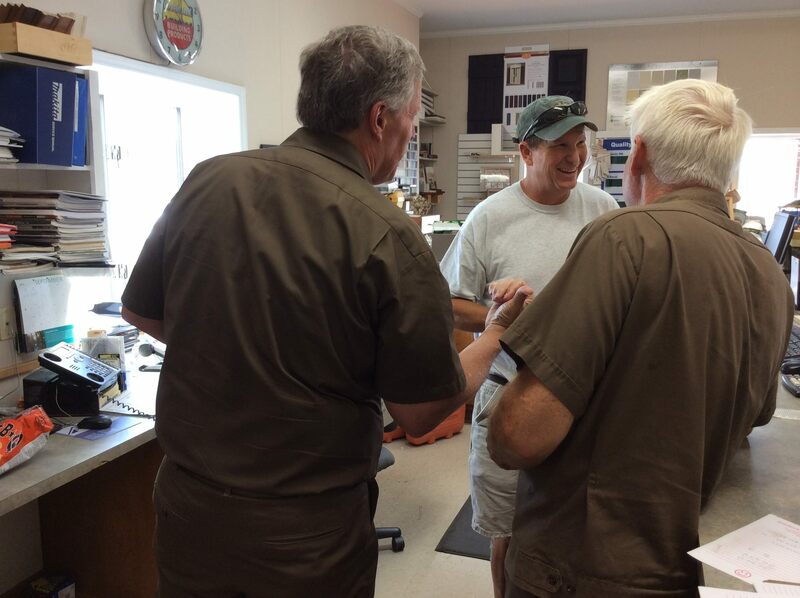 Inside, Meadows chatted with the pharmacists for a few moments before they headed over to Wall Lumber Company for another delivery. 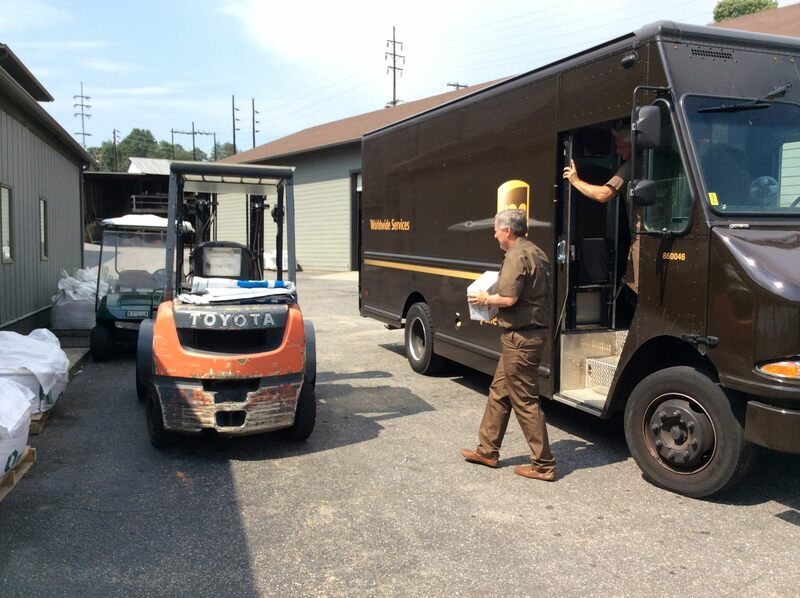 “Hey, I’m Congressman Mark Meadows, I’m coming along seeing how real work gets done with UPS,” he introduced himself to the workers inside. “Well why are you riding with him?” one of them joked about Aldridge. At the final stop of the tour, Table Rock Pharmacy, Meadows walked inside with Aldridge again to deliver the package and chatted with the pharmacists and owner for a few minutes. 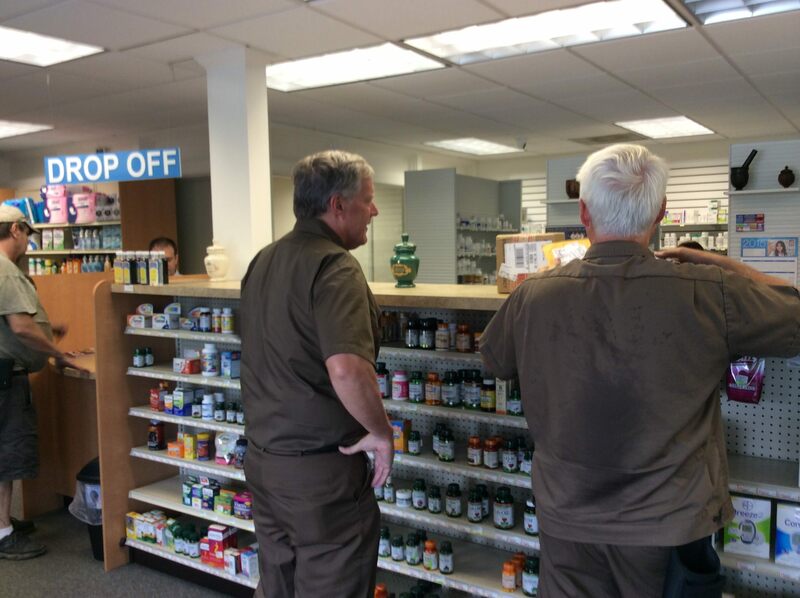 “Marvin, are you in trouble again?” one pharmacist joked with Aldridge as they walked in. “No, I’m not Donald Trump,” Meadows replied, explaining how he’s a Republican Congressman and why she should vote for him. Aldridge represents the type of blue collar, independent-minded American worker who Boehner Republicans have left behind as the national Republican Party has sought to push for the needs of special interests, lobbyists and corporate donors rather than the wants of ordinary Americans nationwide. He, like so many others Meadows would meet with throughout the day, doesn’t fit into a cookie-cutter mold of a checkbox voter that pollsters can cram into a focus group designed to push an agenda or an establishment candidate. That’s who is standing up in late 2015 heading into 2016, revolting against the Washington establishment while demanding accountability and true representation from their government and elected leaders. 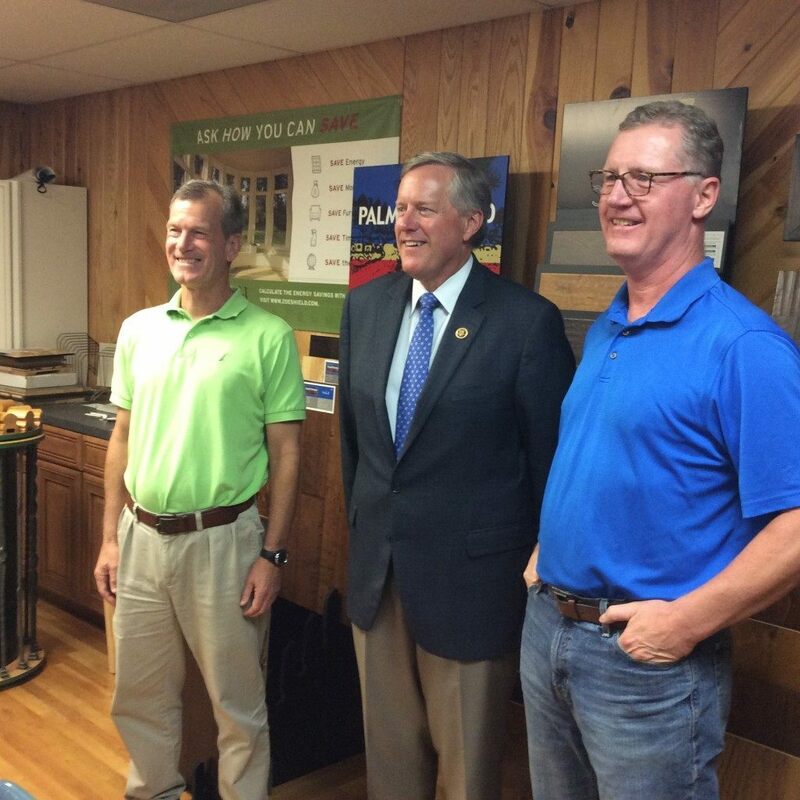 While Congressman Meadows isn’t Donald Trump as that woman inside Table Rock Pharmacy first thought he might be, he may just be the Trump of Congress. He’s the public face of shaking things up in D.C., and he’s channeling voter frustration into demonstrable action inside the beltway while working overtime to understand what they want then translate that into reality: Government that works for people, rather than against them. 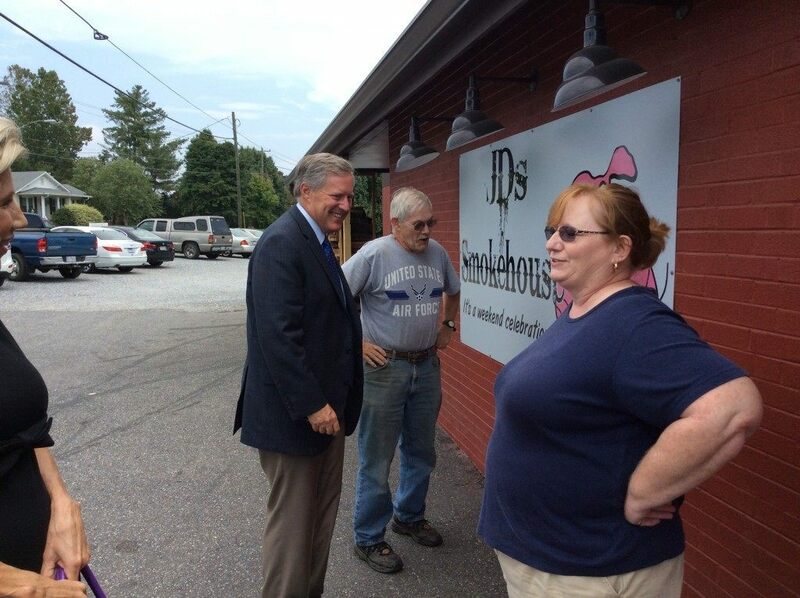 From here, it was off to J.D.’s Smokehouse in nearby Connelly Springs, North Carolina, for a lunch with local county officials including County Manager Bryan Steen, chairman of the board of the County Commission Johnnie Carswell, County Attorney J.R. Simpson, and assistant County Manager and finance director Paul Ijmes. 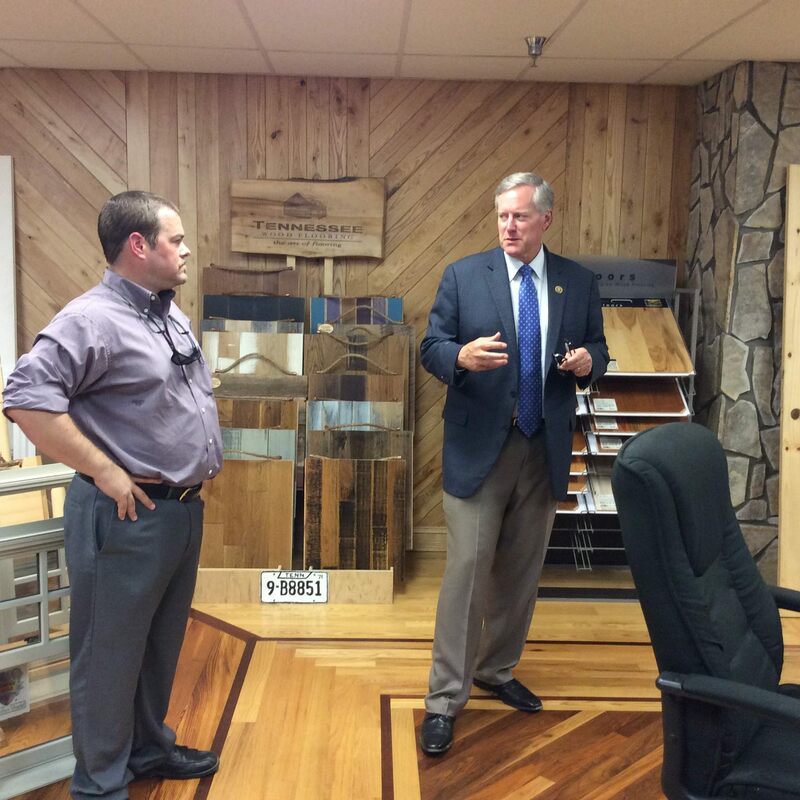 Meadows’ wife Debbie, assistant chief of staff Wayne King and one of his key district staffers joined too. 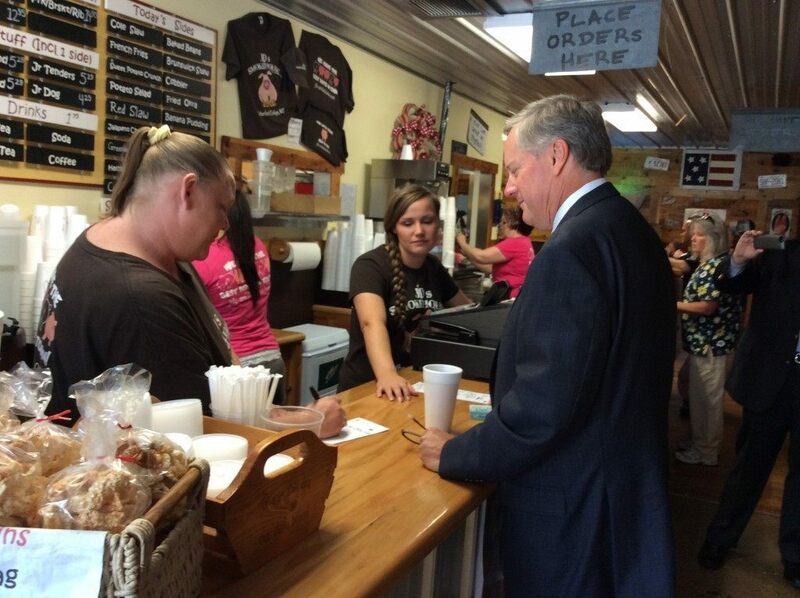 Walking into the restaurant, Meadows shook hands with staffers who were delighted to meet their Congressman—and took photos with several people sitting in booths around the restaurant. Burke County sheriff Steve Whisenant, a Democrat, was seated along with several law enforcement officers at a table in the back of the restaurant nearby where the group meeting Meadows would eventually sit. 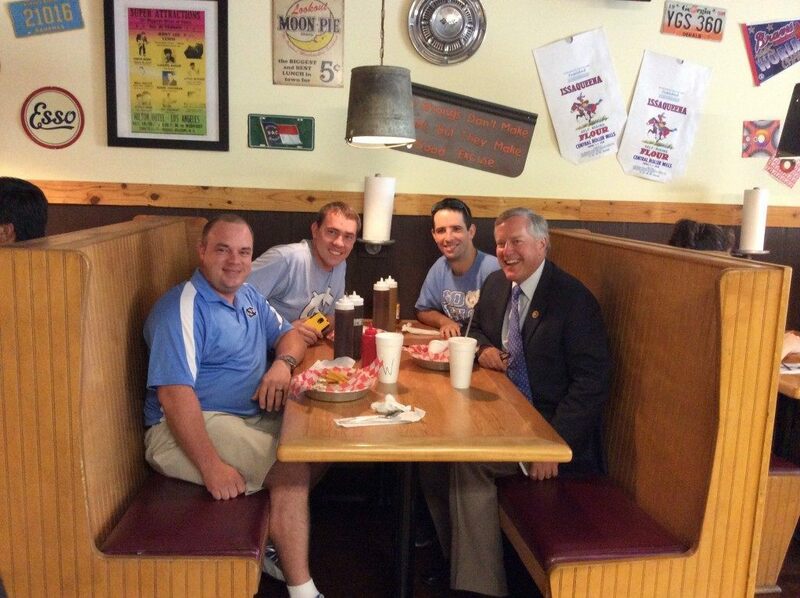 Before ordering his food at the front of the house, Meadows made it a point to say hello to Whisenant and his officers. “He’s very receptive to law enforcement and how the culture has changed for law enforcement officers across the United States, so we’re appreciating him recognizing that and supporting us like he does,” Whisenant told Breitbart News when he wrapped a brief conversation with Meadows. Throughout the day, whenever he saw a police officer anywhere—whether it was the officer doing his protection detail at his stops or anywhere else—Meadows ran up to them, introduced himself, thanked them for their service, took a photo with them, and gave them each congressional Challenge Coins with his district’s insignia on them. Like virtually every photograph he takes with anyone from his district, his staff gets their contact information then Meadows later prints the photos out in high resolution, signs them and mails them back to his constituents. “We agree with it 100 percent,” Carswell said of Meadows’ work to replace Boehner with a Republican alternative. During the lunch, mostly Steen but Carswell and the others as well walked Meadows through how there are jobs in the district in manufacturing that need to be filled and the problem is that there are too many young people leaving the district to pursue four-year-college-degrees in fields that they can’t find employment in later after graduation. If they instead sought two-year technical degrees, they would be able to work immediately after graduation at jobs paying as much as $75,000 a year for starting salary in the furniture factories nearby, an incredible starting salary for someone as young as 20 or 21 years old. But thanks to a culture in Washington — and politicians pushing trade deals and immigration policies that have shifted not just the demographic make-up of the entire country but the economic engines of manufacturing and blue collar work that dominated America’s last generations — these local officials are left planning for the next generation rather than the current generation. Carson said that there is a serious problem that he’s fighting from a local level, the notion that all kids in America need to go get a liberal arts degree from a four-year university. 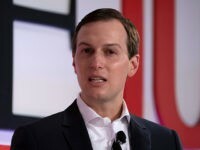 Trade policies from Washington have mortally wounded textile plants and manufacturing factories throughout America, but there are signs of life in those industries if the right leadership in Washington makes it into Congress and eventually the White House. Boehner has been pushing things like the Obamatrade package earlier this year that continue seeing jobs slip overseas to Asia and Mexico, but Carson says the people here trust conservatives like Meadows to lead on these issues to ensure that American jobs stay in America. 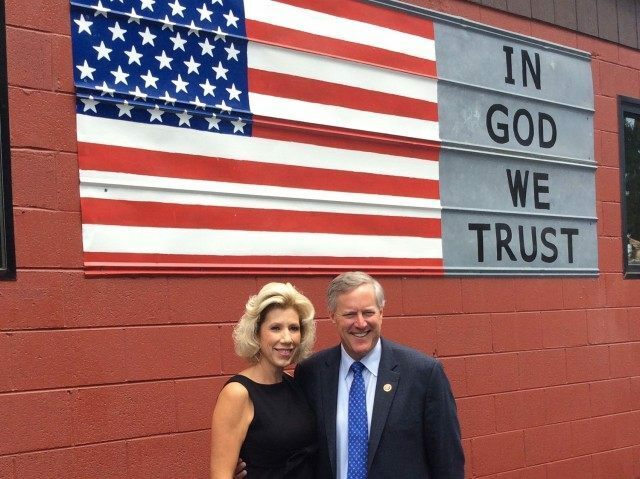 It’s because of this leadership that the owner of J.D.’s Smokehouse, Debbie Goare, is so proud of Meadows for standing up to the Washington establishment in both political parties. 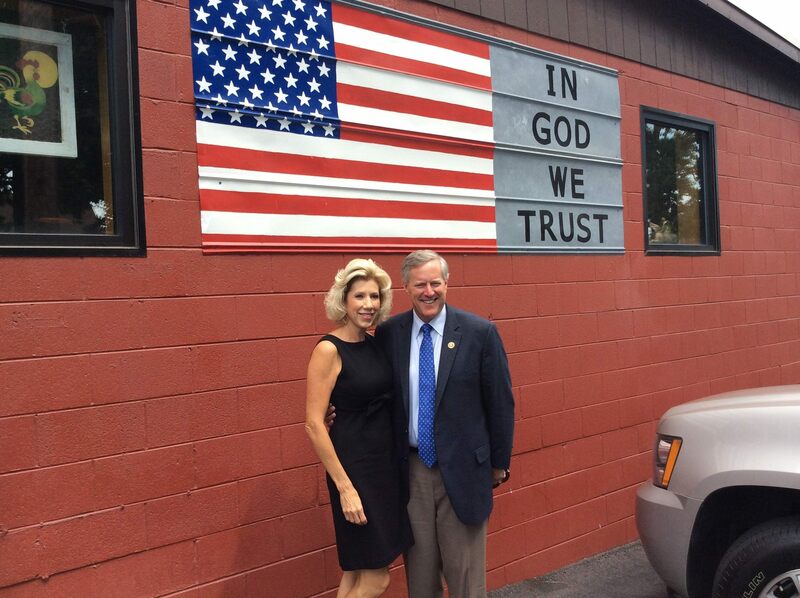 “It’s refreshing to see a Christian representative and one who has the same beliefs as I do,” Goare, who told Breitbart News that this was Meadows’ first visit to her restaurant, said in a brief interview. When asked about Meadows’ move to oust Boehner as Speaker, Goare said it’s time for new Republican leadership in Washington. Goare is pleased with Meadows’ representation of the district, and hopes that he can lead efforts as well to get rid of Planned Parenthood and Obamacare. 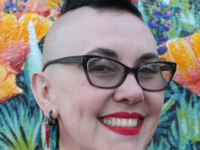 “It’s disgusting,” Goare added of the Planned Parenthood videos from the Center for Medical Progress. “It’s absolutely disgusting. These are not fetuses. These are children. It’s just –“ she began crying. 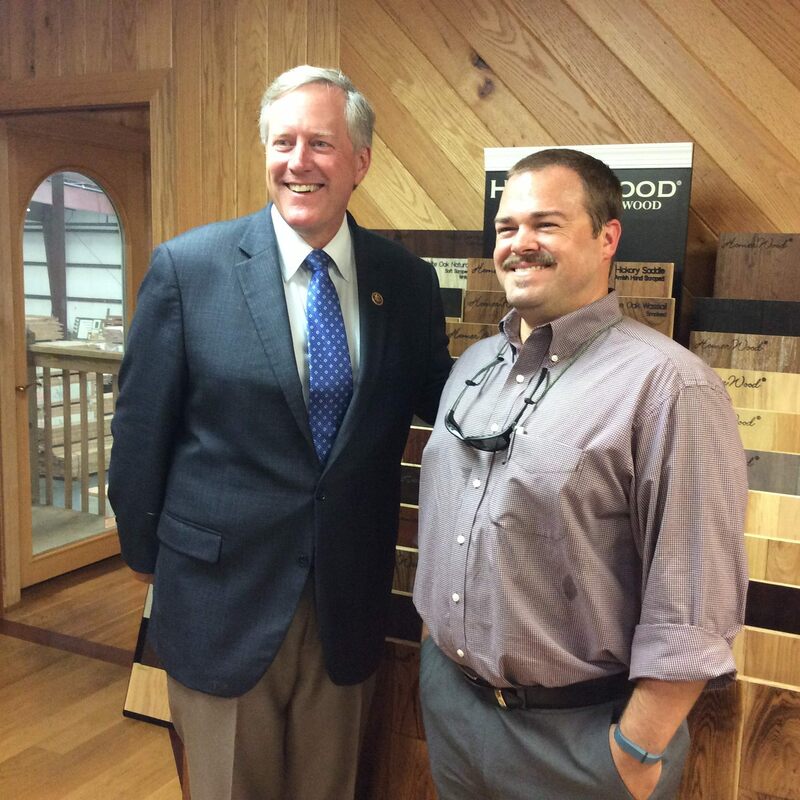 After lunch, and after several more people in the restaurant wanted photographs with Meadows, the Congressman and his staff headed over to a local lumber refinery in neighboring Caldwell County. 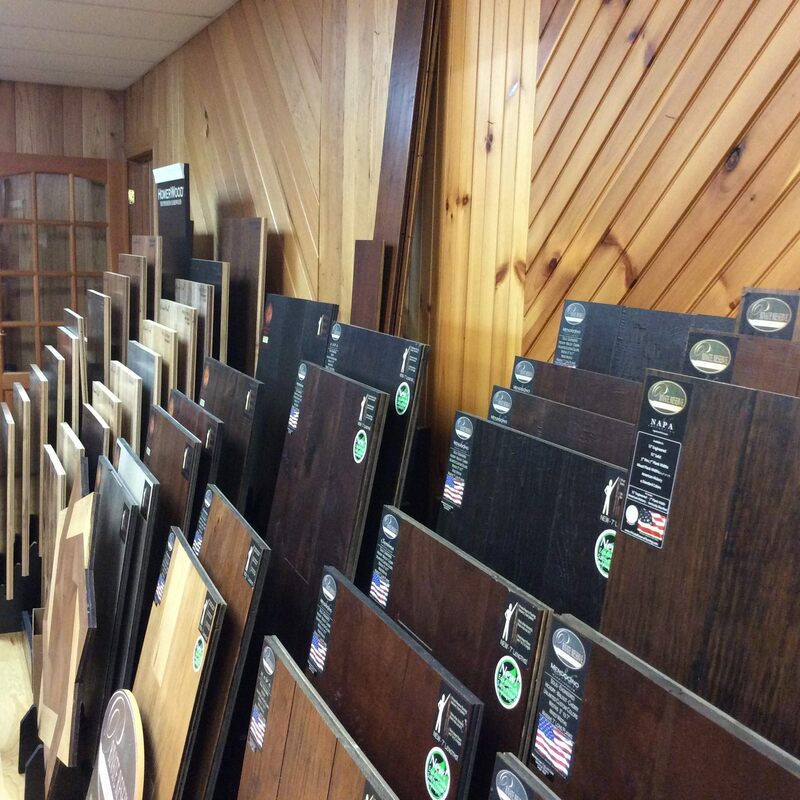 Granite Hardwoods Operations Manager Richard Buchanan, whose family has run the lumber company there for four generations now, took Meadows through the grounds of where workers took raw timber and prepared it to be made later into hardwood floors or furniture. Rick McCreary, a lumber buyer and salesperson for Granite Hardwoods who accompanied Meadows, Breitbart News and another local reporter on the tour, explained to Breitbart News that the company buys freshly chopped wood from all over the Appalachians all the way up to New York then prepares it into pieces for final refiners in either the United States or over in Asia to make hardwood floors or furniture from it. McCreary has known Meadows since before he even decided to run for Congress—and thinks he has “absolutely” done a good job representing the district in Washington. David Learner, the district attorney for Burke, Caldwell, and Catawba counties—the 25th Judicial District of North Carolina—told Breitbart News on the tour he is also relieved that the district finally has someone standing up for them in Washington, D.C.
Caldwell County commissioner Jeff Branch, also on the tour, praised Meadows as well in an interview with Breitbart News. 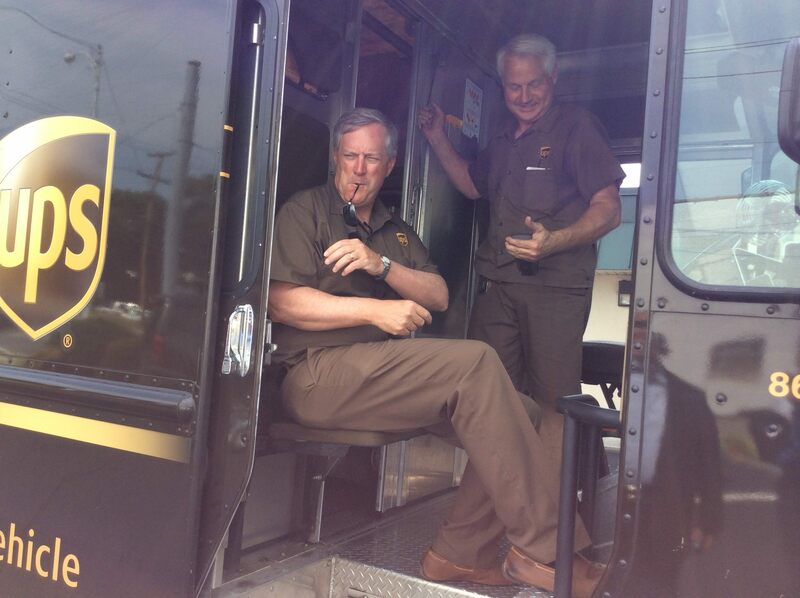 “That’s above my pay grade,” Mahoney responded. “Come on, you’re eight years into this, you’re no longer a newbie,” Meadows ribbed him. 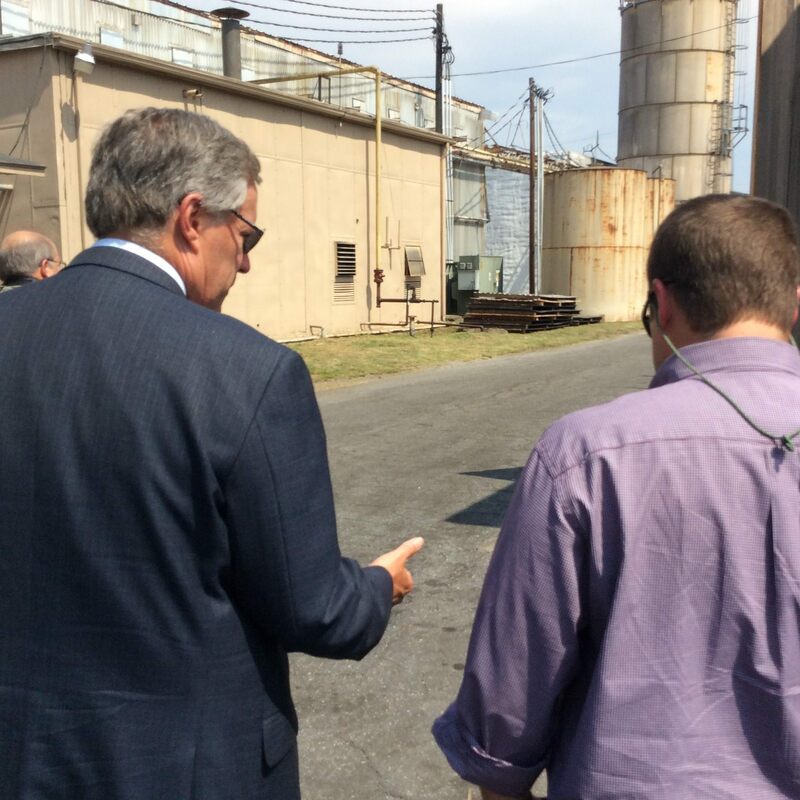 From there, it was off to Meadows’ district office in Lenoir where he’d hold a meeting with officials from the North Carolina Wildlife Federation (NCWF). They’re a coalition of people who believe in preserving the environment for a variety of reasons, from environmentalist viewpoints to hunters and fishermen who want to ensure that the environment is there for their sport for a long time. G. Richard Node, an NCWF affiliate representative and the National Wildlife Foundation’s sportsmen outreach coordinator, and one of his colleagues met with Meadows for nearly a full hour, breaking down various concerns they have with forestry regulations and wildlife preservation for the purposes of hunting and angling. After that was Meadows’ half-hour-long exclusive interview with Breitbart News, the first parts of which show up here and more of which will be coming out soon, then it was off to a town hall where for more than an hour Meadows answered questions of 40 or so constituents at West Caldwell High School. Before the town hall started, Lenoir Mayor Joseph Gibbons — another Democrat — praised Meadows for his service, showing his widespread bipartisan appeal district-wide. “We voted for him to represent us, not to represent the Speaker of the House,” Thuss said. Meadows fielded questions during the town hall about Planned Parenthood, the Iran deal, anchor babies, sanctuary cities, Benghazi and more before the topic turned to Boehner. That’s why Meadows is so dangerous to Boehner: He’s channeling the voice of America on Capitol Hill, a decidedly pro-representative government, anti-Boehner voice, and he’s encouraging his colleagues to join him.